Enjoyed this wonderful exhibition at the Ververij in Ronse by women artists who weave their life into their artistic medium, whether it was weaving scarves or carpets, lace, ceramics or performance. Each medium has its own expression. The exhibition almost felt like an orchestra, with each piece adding to the sound of the whole. I have some more photos at flickr. Sorry for the rather short post, but my college exams are coming up and I feel the heat…so it’s back to the books for me. Wish me luck! Sorry I’ve been away for a bit! it was just all a bit much, I guess. But not necessarily bad, just much, and I do need my time to recharge…social butterfly that I am! And there’s more cuteness to be had: 2 1/2 weeks ago I adopted a very fluffy white cat from this brilliant local cat rescue initiative: www.katzoektthuis.be. They’re a couple of volunteer families spread over the city of Gent, taking care of the stray cats they can catch, or at least feed them. The rescued kitties get a medical check-up and are spayed/neutered before finding their way to a new home. And with all the piano moving and reorganizing and rocking chairs in the summer, my living room has finally become something of a room to live in! Her refined illustrations were exactly what I was looking for: They bring the outside in -the natural elements with the leaves and butterflies and organic textures- and the inside out -archetypal references, the intrigueing atmosphere… Lovelovelove them! They hang above the (now tuned & happy) piano, at eye height. And they really love to be watched from a distance, they almost beckon you, and then you just want to discover all the tiny details with your nose to the frame! If you’re intrigued, check out Vocisconesse’s Dawanda shop and the museum of tarot in Riola (Italy), which features a tarot deck (Tarocchi di Connessione, 22 cards of the major arcana) she’s created (you can buy it on this page, 7th from the top). Journal of Mythic Arts: you will be missed! Have you ever heard of the Endicott Studio? All on mythology/fairy tales/folk art and contemporary artists/writers/performers! Even though this is the last issue, it’s well worth to explore the rest of the Endicott site, blog and former issues of the Journal. These kindred spirits have taught and inspired me for years…and you maybe as well? The day itself had its own challenges, as we had been treated to typical Belgian weather the weeks before: showers, winds, all sorts of interesting weather phenomena but the one you’d associate with the usual summer vibe: sun. But miraculously it was lovely, only that sunday! Some clouds, some generous sunny patches…brilliant! You see, we had had to make our own stands (the organization only provided tables and chairs), while I loved styling it I hadn’t found the time to design, let alone make a rain-proof stand! Now how do you style a stand? Is there a manual?! I didn’t have much of a clue at first. It’s not just finding a practical way to show your art work but also how you want people to perceive it. How to give them an impression of who you are and what your art stands for. I had sort of wanted people to be intrigued by the look of the bigger items than just the jewelry itself. Jewelry can be kind of abstract if taken out of context -i.e. when its not worn by real people. So I tried to create the atmosphere of my jewelry with items I could drape, hang or hook them on. I was really happy with how it all turned out -the contrast between the two long winding horns (from that quaint little shop in Antwerp), the smaller ones that carried the ring and some earrings and the pissed-off clay elephant that I had borrowed from a friend: this elephant had the most funny expression on its face (I had filled it with sweets) and on the other hand the funky ensemble of handblown (not by me) vases of different sizes & colors and huge transparant glass rods matching and contrasting the colors of the vases (the ones I use for glass beads are much thinner, these thicker rods are used for glass sculptures and presse-papiers), thanks to my fellow obsessed glass people & suppliers G & Q …even down to the jewelry boxes I had folded myself (with a little help from my KANTL colleagues…! ), the little photo album I had assembled and printed (with examples of all my collections and some action photos so people could see this was indeed all handmade) and my address cards. We arrived one hour before it started, which gave us just barely enough time to build our stand! 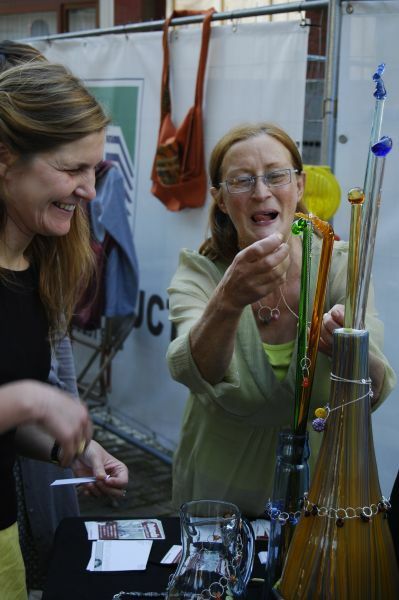 Officially it started at 12.00h but visitors came flocking towards the market already. We had found a great spot in a corner of a building area, so we could make ourselves a little “fort” with the table. And the fence was ideal to put up all the Dawanda posters Elizabeth had sent! It was as if we had found a Wishing-Table because in no time we had it draped with the black cloths, and all horns, vases and elephants were accounted for. I wasn’t the only Dawandanian there, Ella from Ella since Osix (see picture) who had her stand at the other side of the market came to say hi. She makes these gorgeous, cheerful shoulder bags from vintage textiles. I was impressed at how well she’s been presenting & marketing her art, finding different channels to sell and attracting a wide range of customers! Something I have still to learn a lot about. 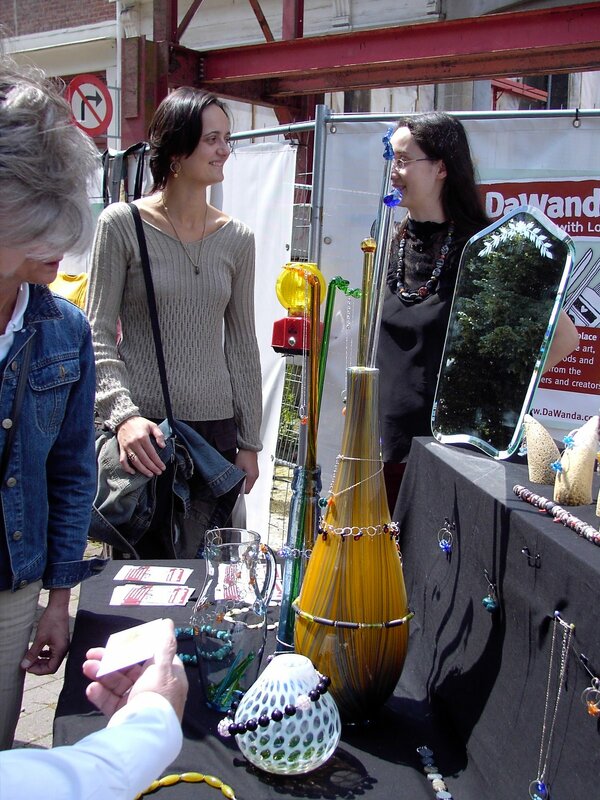 Also Nadine from PandoraPearl had come all the way from Dordrecht, NL and paid a visit with her friend -she would have participated at the market if she hadn’t had such a big sale at her 4th of July sale the week before! She makes lovely wire-wrapped jewelry with all sorts of glass, semi-precious and pearl beads. Maybe she’ll be there with a stand next time. I saw a lot of my friends back as well (I grew up in Antwerp where the market was held, but swapped it for Gent a couple of years ago). There was Mireille (who’s creating handmade stuffed dragons and Pullip dolls’ accessories which she sells on Etsy, and she’s got a jewelry shop coming up there too!) who finally got her lucky, bubbly fish necklace, I saw Liesbet and Tinne back, Jessy and her boyfriend Joris whom I handed my photocamera so he could play a little…and luckily for us we have some pictures now! Dank u Joris… 😀 You can see them in the Markt van Morgen flickr group! So was it all a success? It certainly was a lot of superlatives for me on many levels. It was so great seeing my friends, meeting like-minded artists and finding out how people reacted to my jewelry, and pushing my own creativity to meet the art market’s deadline the weeks prior to it… I even made some sales! Hehe. But at the same time it was also quite stressful for someone like me: that said deadline of getting everything finished on time, and dealing with several people at the time for a couple of hours straight is an introvert’s nightmare! It left me dazed & frazzled by the end of the market, and I was more than happy to break it all up and go home. However, after a good night’s sleep I had returned to my normal self again, and knew that all in all it had been a wonderful experience. And now two weeks later I feel achieved and that I have really deserved my summer holidays..and guess what, the sun is finally here to stay! 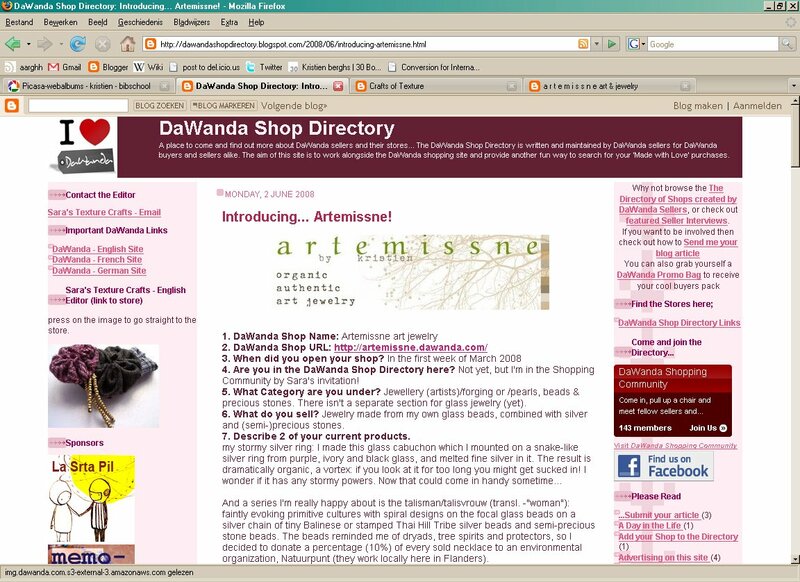 I got featured in the Dawanda Shop Directory blog! -She works with textures, both in fabric and paper, has a shop on etsy, dawanda and her own site AND manages (among others) to maintain the Dawanda Shop Directory blog all by herself and writes for DIY City Mag! But now almost a week has passed and I had my final exam for library school yesterday (it went fine, thanks for asking!). I have also been creating some new necklaces and earrings last week for the”light” collection of duizendbloem…really needed to do that! And no, the box and the jewelry is still missing and I shouldn’t hope on ever finding it or getting it back. But at least I have pictures of most, and some of them were used in Patrick’s photoshoot last sunday so at least I have something beautiful to remember them by. Luckily I’m not a materialist, although the whole thing has made me a cranky idealist. I miss them! That said, I have an art market in a bit more of a month and I’m planning to make the best of it! Oh, P.S. de schele Rosse is now called Jack, or even Jack the Sixth! He’s doing better, although it will take a long time before his cut will heal. See, murrini are just so much fun! 😀 I discovered Sarah Hornik has found her own murrini mania and the gorgeous beads she made with them! Check it out, it’s totally inspiring -and a bit frustrating for someone who has two weeks of exams in front of her. Waah! I want to torch right now!